The Karoo National Park is home to Springbok, Black Rhino, Buffalo, Cape Mountain Zebra and many species of Antelope and small predators. Accommodation consists of self-catering chalets and camping. There is a shop and restaurant. There are three wheelchair accessible units in the park and a wheelchair-friendly Braille trail which displays some of the interesting and tactile fossils of the area. Unfortunately, some of the public buildings are a bit challenging to wheelchair users but can be negotiated with assistance. The park has facilities for small conferences.Activities include night drives, a four-wheel drive route, day hikes and self-guided game trails. This is a great place to stop over for a night or two if driving between Cape Town and Johannesburg. 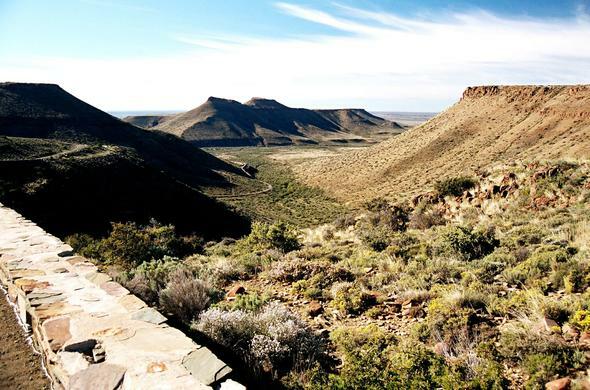 It is a drive of about five hours from Cape Town.The wonderfully scenic Karoo National Park, which is worth a visit for its own sake. It is conveniently situated about 10km on the Cape Town side of the town. With lots of different birds and other game, its an attractive and exciting place to stay. Even if you only plan to overnight, it is worth fitting in a quick game drive or a walk. A bonus is the short interpretive "hands on" fossil trail, which is wheelchair accessible and has interpretive Braille plaques.